Originating in the UK, the American version of the show is hosted by Regis Philbin, veteran of various talk shows and game shows. He leads the contestants through a series of questions with their hopes of them winning a million dollars. The contestants that appear onstage with Regis are chosen in the Fastest Finger round. They are presented with four answers, and need to put them in order of date, location, etc. The fastest player with the correct answer wins the right to join Regis onstage for the chance to win the big prize. In the main game, Regis asks a series of fifteen questions, each a little tougher than the last. The dollar amounts they win with each correct answer increases as they go along, starting with $100, and ending with one million dollars. Once a contestant reaches a safe money level, they can’t go home with less than that amount even if they answer a later question incorrectly. The contestants are presented with four answers, but this time they need to select the correct one. If they aren’t sure of the answer, they can choose to get help from a lifeline. Initially the three lifelines offered are Phone a Friend, Ask the Audience, and 50/50. Later lifelines include Double Dip, Ask the Expert, and Switch the Question. 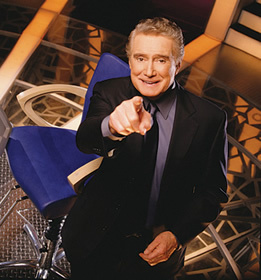 Once the contestant decides on an answer, Regis traditionally asks them, “Is this your final answer?”. If it is, the audience and contestant all hold their breaths to see who will take home a big cash prize or just a small one.